Place by Design is SXSW’s public space design competition, celebrating transformative work at the intersection of art, technology, and design that rethinks how we use and interact with our cities. The six Finalists will present their work in a fast-paced showcase during the Cities Summit to the Place by Design Jurors. 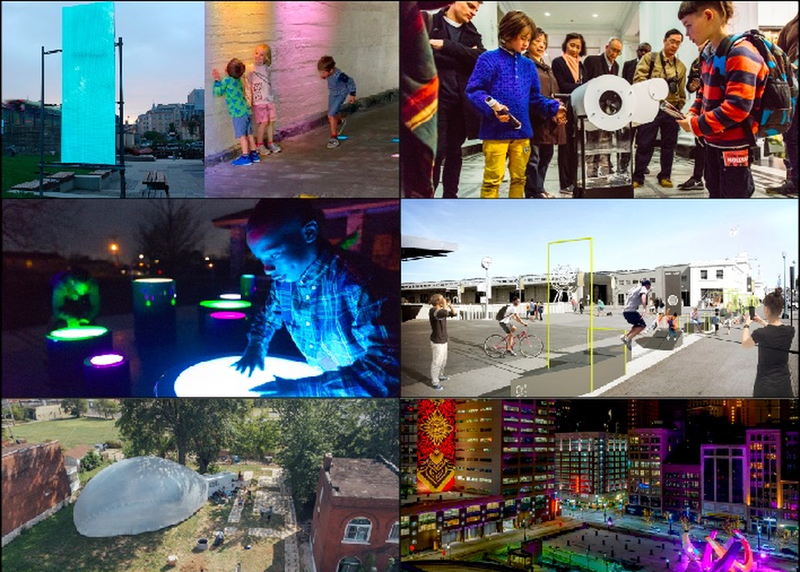 Adressaparken is a multi-use playspace with activities based on technology, media and art. LuminoCITY x STEREOBOT is an urban, immersive art activation network linking together districts in Detroit. The Hangout is an interactive installation that sparks social interaction through play using sight, sound, and touch. Public Rec is building fitness into the fabric of cities, starting with a new type of gym. Featuring SPACEBUSTER, a mobile urban activator, We Like America explores facets of The American Dream by instigating nomadic and transitory spaces. Dryver is a mobile drinking fountain robot that produces water from air, reflecting the absurdity of bottled water.